The origin of Wing Chun Kung Fu can be found in the turbulent, repressive Ching dynasty of over 250 years ago. It was a time when 90% of the Chinese race, the Hons, were ruled by the 10% minority, the Manchus. The Manchus placed a great amount of unjust law on the Hons. For instance, all the female Hon infants were made to bind their feet so that when they grew up they would be dependent upon their parents or husband. The work opportunity of the Hons was also restricted. They were unable to hold office in Government higher than a certain level. Heavy tax burdens were placed on the country so that the Manchus could have economic control of the Hon people. Kung Fu training was also banned for the Hons, however the Manchu Government was adopting the Hon culture. They respected the Shil Lim Temple as a Buddhist sanctuary. When all weapons were outlawed by the Manchus, the Hons began training a revolutionary army in the secret art of Kung Fu. The Shil Lim Temple became the secret sanctuary for preparatory trainings of a classic style which took 15 to 20 years to master. To develop a new form, one which would have shorter training time, five of China's grandmasters met to discuss the merits of each of the various forms of Kung Fu. By choosing the most efficient techniques from each style, they developed training programs that would develop an efficient martial artist in 5 to 7 years, one third the original time. However before this new form could be put into practice, the Shil Lim Temple was raided and burned by the Manchus. Ng Mui, a nun, was the only survivor of the original five grandmasters. She passed her knowledge onto a young orphan girl whom she named Wing Chun. The name represented "hope for the future". In turn Wing Chun passed her knowledge on to her husband. 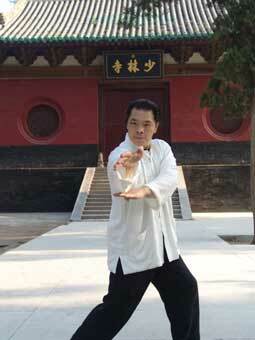 Through the years the style became known as Wing Chun. Its techniques and teachings were passed onto a few, always carefully selected students. In 1950 Yip Man started to teach Wing Chun in Hong Kong. One of his first students was the new Grandmaster, William Cheung, head of the World Wing Chun Kung Fu Association.